Nearly two years after CVS became one of the first major retailers to actively block Apple Pay at its stores, the drugstore chain on Thursday rolled out "CVS Pay," a proprietary barcode-based mobile payments and rewards system. 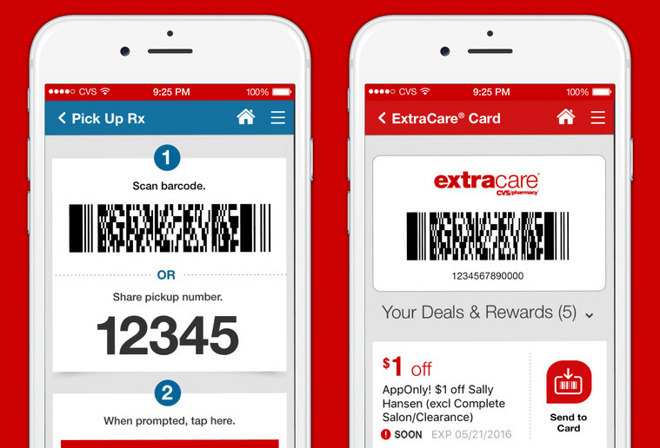 Dubbed a "breakthrough, end-to-end mobile payment experience," CVS Pay lets users refill prescriptions, provision credit cards for payment and manage ExtraCare loyalty rewards from the CVS Pharmacy iOS app. Unlike Apple Pay, which relies on tokenization and secure NFC technology, CVS Pay uses an on-screen barcode to transfer sensitive account information between devices. The app is trusted to secure credit card data, customer prescription information and ExtraCare loyalty points, all of which are communicated to compatible point of sale terminals via a single scan. Alternatively, drive-through customers can provide a special pickup number prior to paying with the universal barcode. Customers receive in-app confirmation of successful transactions, which can be referenced at a later time for record keeping purposes. Importantly, backend verifications for prescription and payment information, like cardholder name, birthdate, signature and PIN, are completed in-app. Currently, the system supports all major credit cards, including MasterCard, Visa, Discover and American Express, as well as debit, Health Savings Account and Flexible Spending Account cards. "Over the past year, our digital team has brought to market numerous new digital tools like CVS Pay that make shopping at CVS Pharmacy easier and more convenient," said CVS Health SVP and Chief Digital Officer Brian Tilzer. "We've been excited by the level of customer adoption of these digital solutions, and we will continue our quick pace of innovation and deployment to make our customers' health care experience even easier." CVS Pay rolled out as a limited release in New York, New Jersey, Pennsylvania and Delaware, with nationwide availability expected later this year. With today's release, it appears CVS has opted to invest in its own payment solution rather than adopting Apple's mobile payment platform Apple Pay. The drugstore is part of the MCX consortium, which in 2014. restricted members from adopting Apple Pay as it readied a competing platform called CurrentC. After months of delays, CurrentC effectively folded in June. Other MCX members, including Rite-Aid and Best Buy, began accepting Apple Pay last year. Industry watchers expected CVS to follow suit, and a store in Florida was reportedly testing Apple Pay as recently as July, though the company is for now going its own way.